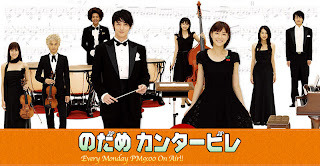 This light-hearted quirky romantic drama is about the story of two totally different characters in the world of classical music, based on the manga by Tomoko Ninomiya. It has its moments of outlandishness, but the storyline is engaging as well as enjoyable, having its comical and moving moments. A definite must watch! Megumi Noda, or known throughout the drama as “Nodame”, is a piano student at Momogaoka College of Music in Japan: an extremely talented pianist who aspires to be a kindergarten teacher. She is a messy and disorganized individual who takes baths several days apart and loves to eat, sometimes even resorting to stealing her friend’s lunchboxes, especially when it is filled with delicacies. She is bad at reading music scores, but has excellent hearing, preferring to play by ear rather than reading the music score. Shinichi Chiaki on the other hand, is Momogaoka’s top student. Born into a musical family, he is talented in both the piano and violin and has a secret ambition of becoming a conductor one day. He is an arrogant multi-lingual perfectionist who lived abroad in the music capitals of the world when he was young; however he is unable to leave Japan due to childhood phobia. These two polar opposites meet by accident and sparks start to fly. Nodame falls in love with Chiaki at first sight; nevertheless it takes much longer for Chiaki to appreciate Nodame’s unusual qualities. Their relationship and interaction causes them both to develop and grow as individuals and musicians. In the due events of their meeting, Chiaki transfers into the Conductor Division, leads a student orchestra and begins to have a greater appreciation of people's musical abilities. And Nodame manages to face her fears, entering in a piano competition. As the story progresses, opportunities start to open up as both begin taking risks - progressing far more than they ever thought possible. The storyline is engaging and there never is a boring moment in this series. You get to know a little bit more of the world of classical music too. It's worth the watch if you want a good laugh, or an unconventional love story. It has a proportionate focus on the different characters and classical music.